Treating hair loss can be an expensive habit, and one that many of us simply cannot afford. So, before you resign yourself to defeat, we've picked out three affordable daily hair 'treatments' that can each be purchased for under £10, and what's more, they could help you prevent baldness and promote healthy hair growth. Saw Palmetto is potent plant derived from North America, and originally tested as a treatment for prostate health, scientists believe it also works as an effective DHT blocker, particularly for men. Some potent multi-vitamin hair supplements contain saw palmetto, but it can also be purchased on its own. Many men and women have experienced great results from taking thi potent extract, particularly a slowing down of hair fall and thinning hair. It doesn't matter which brand you go for, all that counts is that it is pure saw palmetto. You can easily purchase a three month supply for around £8-£10, depending on where you buy. Also, try to stick to the safe daily intake which is around 250mg, maximum. Again, argan oil is not FDA approved as a treatment for hair loss, but it is classified as a hair beneficiary that is used in many hair growth serums and shampoos on the market. A £10 bottle of pure argan oil will see you through around two to three months - remember, a little goes a long way with this stuff. Argan oil will not cure baldness, but it can add essential nutrients to your strands, for overall appearance and health. 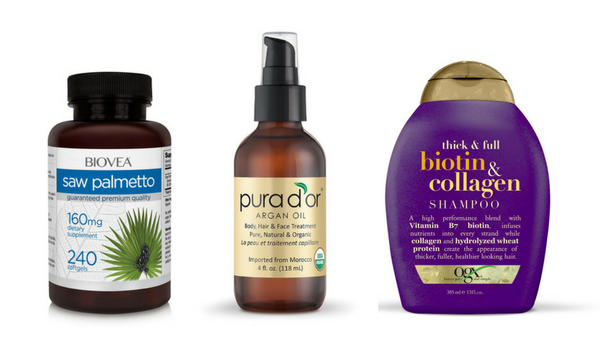 Many people take Biotin in supplement form, but we'd like to suggest using it in a shampoo. OGX Biotin & Collagen Shampoo has to be one of the best shampoos of its kind on the market, especially for the price. At just £6 per bottle, you should definitely purchase this shampoo if you are serious about the health of your hair. Biotin (Vitamin B7) is a potent yet safe hair growth agent - couple that with Collagen, a cell renewing ingredient responsible for maintaining the strength and elasticity of bones, joints, tendons, skin, eyes, internal organs, nails and of course, hair - and you have the perfect blend for healthy hair.